See also: Avoiding Stress for the rest of the year. Some people rate Christmas as being more stressful than divorce or being burgled. We don't want to add to the stress and have deliberately avoided putting images of holly, robins, snowmen or anything else Christmassy on this page! The page does, however, provide some tips and advice to make your Christmas as stress-free as possible. Don't let the festive season get you down: follow the tips and advice you find here, relax and enjoy yourself. Start making a list of things you need to do for Christmas early: for example, shopping, food and presents, decorations, seating plans or travel arrangements. Make the list as detailed as possible, include people’s phone numbers or email addresses to make contacting them simpler. If it's already too late, bookmark this page ready for next year and set yourself a reminder to do this in mid-November. See our pages: Time Management and Delegation Skills for more ideas of how to get organised and prioritise your tasks and time. Although shopping locally has many advantages, High Street shopping just before Christmas can be particularly stressful, often cold and wet (in the UK anyway) and with hundreds of other stressed people trying to find the ‘perfect’ gift. Shop online from the comfort of your own home as you’ll not only save time and be less stressed but will probably save money too. Always make sure you buy from reputable online retailers and check that they can deliver before the big day. Take advantage of a cash back site such as TopCashBack in the UK to save even more money on your purchases. Start writing your Christmas cards early too! Many people receive and send lots of cards at Christmas time so start in mid-November, if you can, and write a few cards and envelopes each day keeping them to one side before posting or delivering. Play some relaxing music, perhaps seasonal carols, and burn some scented candles, incense or aromatherapy oil. Take a relaxing hot bath to unwind. Our pages: Relaxation Techniques including Aromatherapy for some advice about how to relax. If there is someone coming to dinner that you dislike, avoid sitting opposite them and instead seat them to one side and opposite somebody who they get on with better. Invite a few more reasonable people along as it will help dilute any stress caused by relatives. It’s a case of the more the merrier! If you are planning on cooking a bird then turkey or pheasant are good choices. They both contain tryptophan which our bodies use to make serotonin, a powerful brain-calming chemical. When your body is under stress it produces cortisol which prepares you for ‘fight or flight’ situations. Caffeine does too; see our article: Stress, Nutrition and Diet for more information. Offer everybody decaffeinated coffee and tea, or herbal tea alternatives, since this will help keep the stress levels down and has the added bonus that people may fall asleep after dinner! When we’re stressed our heart beat increases and our breathing shallows, it’s all part of the fight or flight reaction. Work on reversing this process and take time to breathe deeply. 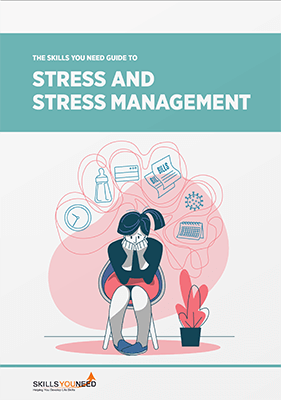 See our pages on Relaxation Techniques and Stress Management for more. Have a 'Great Escape' Plan! It's a good idea to have some pre-planned excuses to escape from proceedings if they get too stressful. Lack of sleep can make you feel irritable and more prone to feeling stressed. Eating lots of rich foods and drinking alcohol can also disturb your sleep, not to mention Santa coming down the chimney in the middle of the night! Our page How to Sleep has lots of further information to help you improve your sleep hygiene and get a better night's sleep. Christmas is, for many, a time of excessive eating and drinking and exercise can be easily overlooked. Diets and gym memberships are particularly popular in January! Exercise is a great way to reduce stress as it burns off hormones such as cortisol and adrenaline and helps produce mood-enhancing endorphins. Try going for a walk after dinner as the fresh air and exercise will lift your mood and make you feel better. Most de-stressing articles will tell you to avoid alcohol altogether but, let’s be realistic, it is Christmas! However, do avoid excessive alcohol as it dehydrates your body and makes your liver work overtime to process it, alcohol can also hinder quality sleep. Drink as much water or juice as alcohol as this will help you to stay hydrated, feel better and therefore cope better with stressful situations. You'll also feel better on Boxing Day. Remember it’s your Christmas too so try to relax and have fun, laugh and be merry. If you do find others around you difficult then try to rise above the situation. If things don’t go to plan try not to worry too much, instead laugh about them and make them into fun memories that you can talk about during Christmases to come. "Remember that time Mum set fire to the sprouts! ".